Last week, someone asked me about code requirements related to panic hardware on balanced doors. (If you’re not sure what a balanced door is, there’s a good explanation here.) The project in question is in Israel, and apparently the code requirements there do not include any specific requirements for panic hardware on balanced doors. However, the codes used most often in the U.S. do contain applicable requirements. Both NFPA 101 and the IBC state that when panic hardware is used on balanced doors, the panic hardware must be the “push-pad” (touchpad) type, and the pad shall extend not more than one-half the width of the door. This is different from the requirements for panic hardware on standard swinging doors, where the pad must be at least one-half the width of the door. The reason push-pad/touchpad style panics are required (in lieu of crossbar style) is because pushing on the wrong end of a crossbar style panic device will not open a balanced door because of the pivot configuration. With a push-pad / touchpad style panic, it’s more obvious that pushing on the pad will allow egress, and it’s less likely that someone will push on an area of the device that will not open the door. 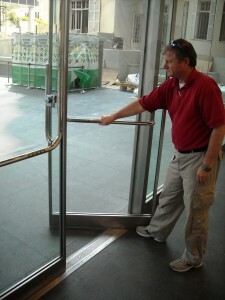 <– This is a photo of the application in Israel, which is a tubular panic device on a balanced door. This is not a push-pad device as required by U.S. codes, but because of the shape of the device with an obvious vertical leg (the device has also been engraved with “PUSH”), it’s possible that a code official might accept the use of this product on a balanced door. If this application was used in the U.S., it would require approval from the code official. As a side note, the green doors pictured above and at right are on the Transportation Building in Boston. Years ago our office was involved with retrofitting automatic operators on a couple of doors at this very busy main entrance, and it looks like they’re still going strong! Photo of doors with tubular panic hardware courtesy of Keith Laduzinsky of Ingersoll Rand Security Technologies in Israel. a. Shal conform to Federal Specification FF H-106 Series 86E. b. Shall be aluminum motise lock with a latch bolt operated by a knob from the outside and a crossbar panic device (per Gov Spec 810H with US28 aluminum finish) from the inside. c. Lockset shall funished without cylinder but capable of accepting a small format interchangeable core. I can not find anything on 810H? All of panic devices including Von Duprin 99 have about 24″ length push pad at least. Most of the balanced door width is not more than 40″. If I push the end of hinge side of the push pad, the door is not opened. How can I use push pad type exit device on balanced door? The Von Duprin 33/35 and 98/99 devices have an 18-inch touchpad on a 3-foot device, and a 24-inch touchpad on a 4-foot device. If the door is 3 feet wide, you should use a 3-foot device and the touchpad will be of the proper size. Can an auto operator activator button for a balanced door be mounted on the Hinge side of the door frame(from the inside exiting out)? Or would the Inverse swing of the balance door swinging in towards an occupant pressing the button be an issue? Essentially can the push button go on the opposite side of the door seen in your first picture? This isn’t specifically addressed in the codes and standards, but I think it could be a problem to install the actuator where someone could come in contact with the heel edge of the balanced door swinging in. Do you have the link for an explanation of what a balancing door is? I have a pretty good idea of what is and isn’t, but I always like to back myself up with your expertise.